Carrie Herbel, chief preparator for the University of Nebraska State Museum's vertebrate paleontology collection, examines a resin copy of a fossil humerus on Feb. 8. The duplicate fossil will replace one used in an exhibit at Agate Fossil Beds National Monument. Stories behind the bones of natural history are being exposed in a quiet, dusty University of Nebraska-Lincoln lab. Located in Nebraska Hall, the University of Nebraska State Museum's lab is tasked with documenting and preserving the more than one million fossils within the museum's vertebrate paleontology collection, which ranges from microscopic mammal teeth to mammoth skulls. "Every specimen we work on is different and challenging," said Carrie Herbel, chief preparator for the museum. "I love it because you never know what you are going to find or discover when you work on a fossil." One of Herbel's current projects, the casting of a duplicate copy of a fossil humerus (upper arm bone) from a Moropus, an extinct mammal and distant relative of horses, tells one of those unexpected stories. A field assistant discovered the fossil as Rob Skolnick, a preparator for the museum, completed surveys of the Lay Ranch beds in Sioux County, Nebraska, and Goshen County, Wyoming, in the early 1980s. Because the fossil was only part of a humerus, the assistant described it as a "junky bone" as he showed it to Skolnick. "My assistant didn't think much of it because it was only a partial bone," Skolnick said. "When he showed it to me, my mouth dropped open because it had the biggest bite marks I have ever seen." Through a bit of research and elimination, Skolnick showed how the bite marks were from a Dinohyus, an extinct genus of pig-like mammals that were as large as bison. The creatures' skulls were more than three-feet long and featured bizarre bony flanges and protuberances. Scientists believe the creature, which is on display in Morrill Hall, was mostly a scavenger that would occasionally hunt, like modern hyenas. "The bites are in the same place modern carnivores try to bite as they attempt to take down their prey," Skolnick said. "This fossil is an interesting way to connect habits in the past with those of today." To tell that story to the general public, preparators created a rubber mold and resin cast (copy) of the fossil, putting the duplicate on display at the Agate Fossil Beds National Monument museum, which is 22 miles south of Harrison, Nebraska. Along with providing information about the fossil find, the exhibit encourages museum visitors to use a set of teeth to discover what type of creature made the bite marks. Herbel is making two new copies of the specimen, which will replace the original fossil duplicate, which deteriorated due to normal wear and tear of the hands-on exhibit. 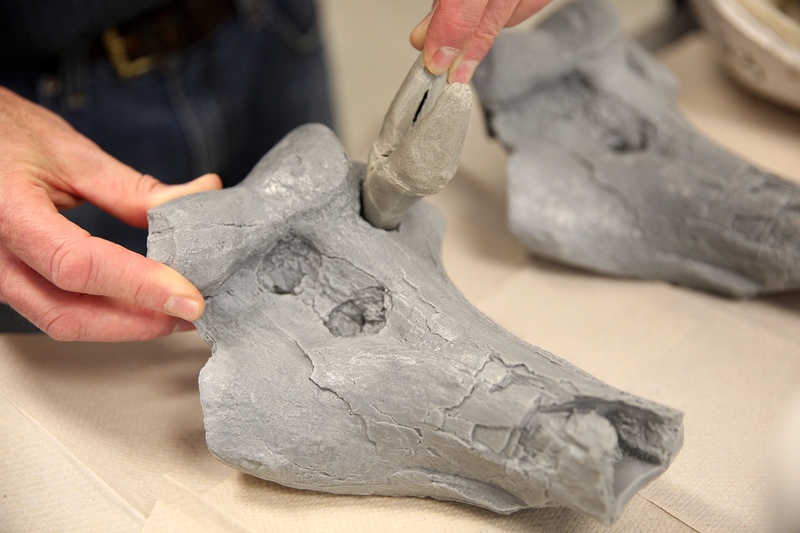 Creating molds and casts of existing fossils is a regular part of the work in the lab, Herbel said. She recently created molds of fossil legs from five different one- and three-toed horses that are on display at Ashfall. The original fossils are being loaned to Harvard University for further study and the molds were made in case something happens to the specimens. "We fully expect the real specimens will come back ready to be put back on display at Ashfall," Herbel said. 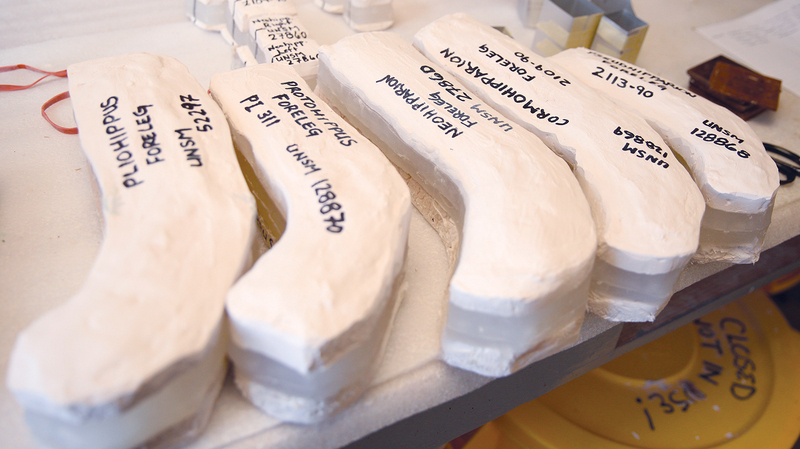 "But, if something unexpected happens, we will have these molds available to make copies." Along with making molds and casts of existing fossils for teaching and outreach, the preparators remove and preserve fossils that were collected in the field, some dating back to the 1930s and 1940s. They also assist UNL researchers as needed. Skolnick is working with Ross Secord, curator and associate professor of vertebrate paleontology, to catalog a large number of microfossils. Working under a microscope, Skolnick carefully removes sediment with tools ranging from hypodermic needles to acid to expose tiny mammal fossils. Some of the teeth collected are molded to allow for copies to be made. Secord then uses those original teeth to track isotopes that can be analyzed to provide information about paleoclimates (past climates). "Every day here in the lab is a little different," Skolnick said. "Whether we're working with microfossils or a mammoth skull, the possibility for new discovery is there. That's what makes me enjoy coming into work every day." For more information on the University of Nebraska State Museum or its vertebrate paleontology collection, click here. Rob Skolnick, prepartor with the University of Nebraska State Museum, demonstrates how a tooth fits into a bite mark in the copy of a fossil he found in the 1980s. The fossil copy is used in a hands-on exhibit at Agate Fossil Beds National Monument. 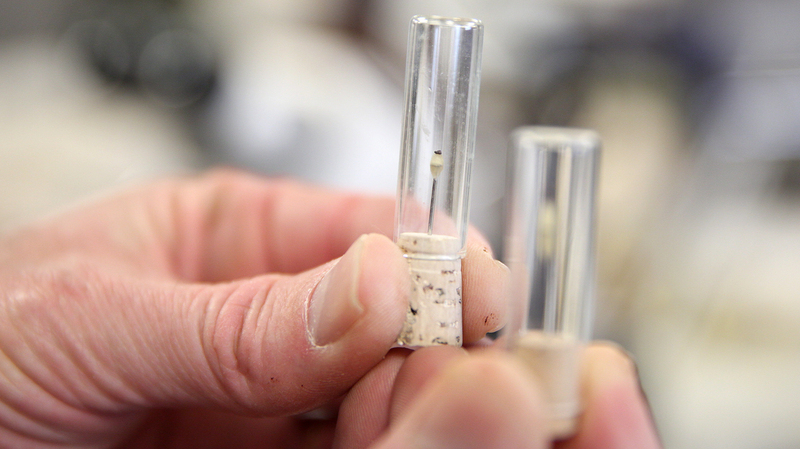 Rob Skolnick holds vials that hold individual microfossil teeth he excavated from sediment. Museum preparators recently created molds of legs from five different horses that are on display at Ashfall Fossil Beds. The original fossils are being loaned to Harvard University for further study. 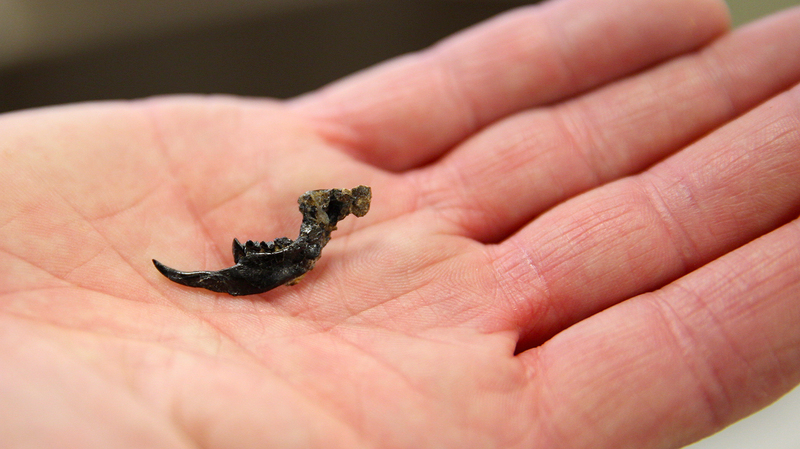 Rob Skolnick holds a microfossil jaw he excavated in the University of Nebraska State Museum's Nebraska Hall lab. 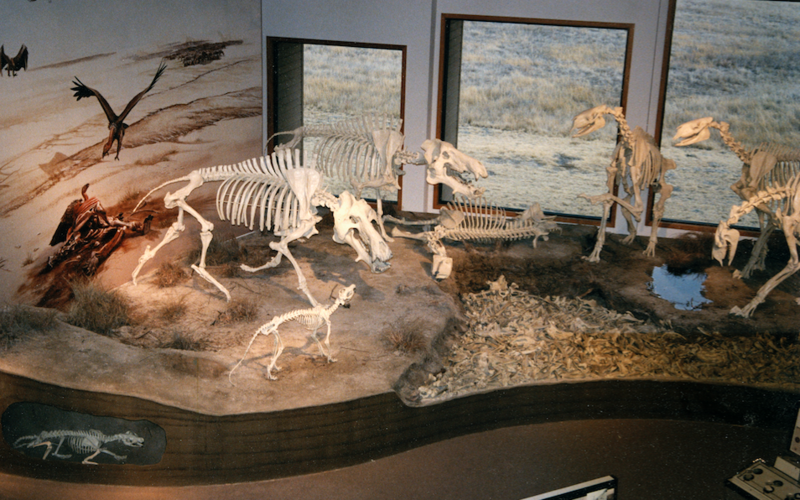 An exhibit at Agate Fossil Beds National Monument features two Dinohyus (left) facing off with a group of Moropus (right). The exhibit includes an interactive task that allows visitors to match molded teeth against bite marks in a copy of the humerus fossil found by Rob Skolnick.